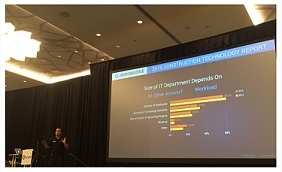 James Benham, president, JBKnowledge, Inc., presented the closing keynote address at the AGC IT Forum Conference on July 31, 2015. As always, he didn't disappoint. Construction companies can make money off of technology! By simply switching to cloud-based plan distribution over printing paper plans, using apps to manage punch lists, and leveraging tablets on construction projects, companies can save real money. The construction projects we are completing today are more complicated than ever. We are building with new methods (Crystal Bridges), we are building taller than ever before (Burj Khalifa), we are building more complex structures (Bird’s Nest) and we are terraforming new land (Palm Jumeriah). All of these projects require better building coordination. Technology can save lives. Safety vests are in development that will track vital signs. Projects designed in BIM can be viewed by safety professionals to look for and eliminate potential hazards. New technology such as tablets and smartphones allow workers to complete their daily tasks faster and more accurate than ever before. Great new apps allow a superintendent to complete and send a daily report in a few minutes, take and send progress photos all day, and measure and document as-built conditions. He reminded the crowd that "The only constant... is CHANGE!" We have to improve, we cannot sit still, and we must get better. One of his clients recently told him "We don’t have to be way ahead; we have to be a year ahead." Mr. Benham went on to explain that there are two types of construction technology currently: Management & Building. We use management technology for processes such as estimating a project, generating a schedule and compiling accounting information. We use building technology for documenting conditions in the field such as progress photos, safety hazards, and as-built measurements. 4. What Software Can be Cloud Based? 5. Do software providers offer integration? Do you have a dedicated tech staff? Do you have a proactive or reactive budget? Do you have an R&D budget? Can you bill IT to projects? SmartInsight is a web-based construction network for searching, selecting and verifying contractors, whether you’re a subcontractor or a GC. The traditional process of prequalification of contractors in the construction industry has been paper, PDFor excel based. If your company has just one office this may not be a huge pain point to solve; however if your company is operating on the regional, national or international level this is a different problem. The SmartInsight platform is designed for contractors to create and share a company profile and enter all of their company information and stats. JBKLabs is the research and development arm of JBKnowledge. The focus of JBKLabs is on several items: (1) micro positioning within buildings using iBeacons (2) data collection through mobile device photography (3) visual and augmented reality (4) 3D scanning, and (5) 3D Printing/CNC. Mr. Benham next announced that the groundbreaking app SmartReality is now available for three new platforms (in addition to the App Store and Google Play Store). App users can now download the SmartReality App for the Samsung Gear, Oculus Rift, and Google Project Tango wearable devices at jbknowledge.com/labs. Mr. Benham told the story about how Steve Jobs believed that companies that build hardware should also create the software for the hardware. Mr. Benham has looked at a few needs for the construction industry in recent years and decided it was time to create a solution for them. JBKnowledge has now launched the JBKLabs initiative. JBKLabs has created the BuildStream platform to solve for three specific construction project tracking needs: site environmental conditions, progress photos, worker tracking and data connectivity monitoring. The platform consists of three parts: Node, Mobile, and Portal. This is the first ever hardware/software combination created by JBKnowledge and JBKLabs. The idea behind BuildStream is simple, a project "Black Box" that collects vital project information. The Nodes were 3D printed at JBKnowledge’s MakerSpace in downtown Bryan, Texas. This device will monitor jobsite data connectivity of both WiFi and wired networks. It does this through conducting constant latency test. The device will also collect local environmental data from the project site such as temp and humidity. Users can take a photo with a mobile device and place it on a plan stored on BuildStream. The photos can be tagged with data items such as date, time and location. The photos are also available to view through a live streaming connection. The online platform is where users can review the data and photos collected on a project site. These are just a few highlights of Mr. Benham’s always informative presentation. Rob McKinney is a construction technology blogger, consultant and founder of ConstructionAppGuru.com, a website with a mission to educate the AEC community about the uses for technology in construction. He is also a member of the AGC IT Forum Steering Committee.